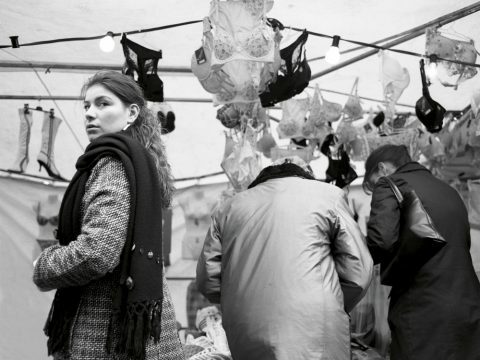 A lady catches me photographing her at the Türkenmarkt (Turkish Market) in Berlin. I made this photograph on a trip to Berlin in my Foundation Year. Like so many aspiring photographers I hadn’t used colour film yet so every image was black and white. The sky was consistently overcast which in hindsight made the experience good for monochromatic vision. I had borrowed a medium format Bronica from Filton College in Bristol and was just getting used to looking down onto the ground glass. It was a wonderful experience to discover photographic emersion; the feeling that you’re removed from a situation, that you’re somewhere else looking in. All those elements, the black and white film, the camera and the fresh perspective add to this image but it’s the Berlin Lady that really makes it. She is looking at me, looking at her through the camera. It takes her gaze over the frame giving the scene an element of Film Noir mystery. She is very attractive. I have to admit I fell a little bit in love with her. The image stands alone in a sea of single images from that trip. The notion of making a consistent series was foreign to me so I came back with a lot of exciting but fragmented photographs; perhaps something closer to memory. I still consider the image to be one of my best though. And I’m still a little bit in love with the Berlin Lady.